Marlins caveat applies, but enjoy the night Reds fans, you’ve earned it. Better times ahead. Luis Castillo gave up two hits and one walk while striking out eight Marlins. He’s made three starts this year and allowed only 5 singles. Not only has he not surrendered a home run, no batter has reached for extra bases. In 19.2 innings, Castillo has 25 strikeouts. That’ll do. Two of the Marlins’ three base runners allowed by Castillo were neutralized on the base paths. Lewis Brinson was picked off. Jorge Alfaro was thrown out stealing on a nice throw by Tucker Barnhart and tag by Derek Dietrich. Michael Lorenzen and his 96-97 mph fastball struck out four Marlins hitters in his two innings of work. The last one brought free pizza. Every fan in attendance got a home run ball tonight! Here’s the honor roll: Eugenio Suarez (2), Jesse Winker (1), Scott Schebler (2), Matt Kemp (1) and Kyle Farmer (2). Suarez, Kemp and Schebler were back-to-back-to-back in the 6th. Jesse Winker, who has been hitting the ball well all year with virtually nothing to show for it, had several more hard-hit balls. In addition to the home run, he singled hard through a pulled-in infield to drive in a run. Joey Votto had another double, his fourth of the season. Suarez had three hits. Schebler had two hits and a walk. Tucker Barnhart had two hits and two walks. Matt Kemp had another hit besides his first homer as a Reds player. Michael Lorenzen pinch hit for Castillo and drew a walk. Watch Winker’s homer and listen to Thom blow the call at the same time! The Reds acquired Luis Castillo from the Marlins on January 19, 2017 for Dan Straily. Believe it or not, the Reds received two other players in that deal. 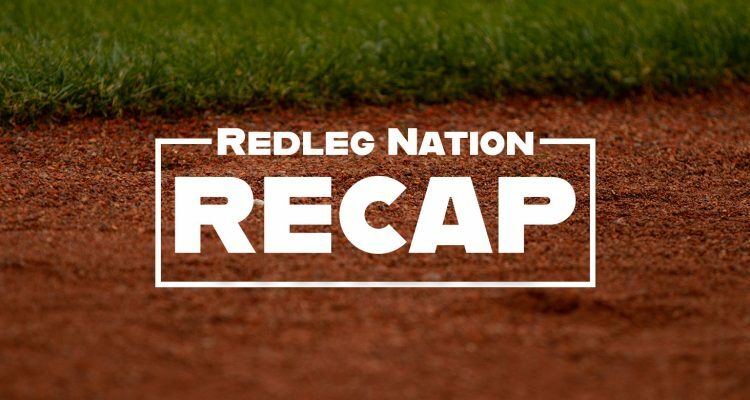 If you were reading Redleg Nation then, you know we liked the trade from the beginning (Reds-Marlins Trade – The Sequel). Castillo made the radar guns pop in his debut against the Washington Nationals (Game Recap) on June 23, hitting 98-100 mph with his fastball. 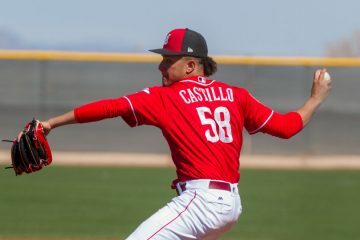 Matt Wilkes recently wrote a set of advanced-stat posts (“How Luis Castillo Can Become an Ace,” Part 1 and Part 2) examining Castillo’s development and way forward. Doug wrote a spring profile of Castillo (Luis Castillo Spring Training Profile). The day of his 2017 debut, I took a look at what got him to that point (Luis Castillo and Real Rebuilding) and wondered whether his call-up would prove to be the curtain rising on the Reds rebuilding process. Wes Jenkins wrote a few weeks later about the hope that Luis Castillo represented (Luis Castillo and What We Know). The Reds are good again! Of the 10 hardest hit balls in this #Reds game, there have been 4 singles and the rest are outs. This is in a game with 5 HR. Jay Bruce has 7 home runs for the Seattle Mariners. The Reds as a team had 8 coming into tonight’s game. The Tigers have hit only 3 — although their record is 7-4. Since 2013, the Pirates lead the major leagues with 433 hit-batters. That’s nearly 100 more than the median team. Need to throw inside to pitch well? The Dodgers have hit 280 batters over that time. The Reds (2-8) play the Marlins (3-8) at GABP in game two of the three game series at 6:40 p.m. The starting pitching match-up is Tyler Mahle vs. Trevor Richards. Are the Reds really seeing a new Robert Stephenson? Well, maybe they relax after this laugher and start playing better. Sometimes a game like this can really get a team going. Or they lose tomorrow 2 -1 . Whatever! Analyzing the performance of a 1-8 team is considered whining? Great that the Reds dominated one of the worst teams in baseball. Certainly better than losing. providing a unrealistically negative season view on the small sample size of ten games is whining. They added an extra wild card spot in 2011 so there is one additional way to get into the post season. I’m also not sure how statistically significant an 8 game losing streak is to the analysis. Lots of teams have losing streaks. It’s probably luck where the losing streak occurs. The 90 Reds had an 8 game losing streak in the middle of the season. Is it anymore important when during the season it occurred? Maybe or maybe not. Also, Jay Bruce has 9 hits on the season. 7 of them are home runs. He’s still below the Mendoza line despite being tied for the league lead in home runs. Reds record is 2-8 but they have outscored opponents 35-34. Seems impossible but it is indeed factual. early in the season 1 blowout will this. Just hope the 1 or 2 run decisions go there way for a while. At this time yesterday, the Reds record was 1-8 and they had been outscored by opponents 21-34. Even factual statements can be deceiving. Lets just hope that this is a start of a good run for the Redlegs. An 8 game losing streak isn’t statistically significant. The 104 win 2017 Dodgers had an 11 game losing streak which was a 1-16 stretch. The 2017 Astros had a 2-9 stretch. The roster of the 2017 Astros and Dodgers may have something to do with 104 wins and World Series champion caliber teams. Cy young winners and Mvp ‘s and Hall of Famers on the roster could be reasons why they overcame losing streaks. The Reds may be a few Hall of famers and All stars and Cy young winners and MVP’s short of those teams. I’m waiting for it. Where are the constant clouds on the horizon, waiting to rain all over this win? Who’s angry the Reds only scored 14 runs, and allowed an insulting 0? Somebody find a way to rain on this parade quickly, lest we all forget this can be enjoyable! Challenge accepted. Dietrich was 0-4 with two strike outs. I’ll step in….tongue in cheek of course…..
Another outstanding pitching performance by Castillo. Three great outings in 3 starts. He is a bona fide top of rotation pitcher. It will be interesting to see how they build a new rotation around Castillo and Gray. Can DeSclafani and Roark keep up? Wood will be back soon, so what happens to Mahle if he continues to pitch well? The new trade deadline rules might get team’s trading earlier. Roark could be a good early trade candidate if Mahle or Stephenson step up large. The Reds could save a few million $$ if they were to trade Roark in May as opposed to July, or not at all. Same with Puig. Don’t you think they’ll have to look at Garrett, Stephenson, or Lorenzen in the rotation at some point? I can’t see Roark or Wood hanging around after this year. Disco is ok, but every time you think he’s getting it together he gets hurt. Stephenson always has potential. Lorenzen can look horrible at times, but he still only gave up 6 hrs in 81 ip last year. Thats hard to pull off in gabp!! Very few guys could do that. I would hope some kind of mechanical change could add bite to his power sinker and he could blossom. Garrett has atleast 3 quality pitches. I don’t see how they can close the door on him as a starter? 3 Options. 1. Mahle is a victim of the Option shuffle and is sent down any way 2. 6 man rotation commences. probably at the expense of Peralta. 3. Disco, the other optionable pitcher (barring a massive collapse Castillo is not getting sent down) gets sent down instead before his service time hits 5y (where a player can refuse a send down regardless of options remaining). Its a tough question. Still, think we should look at Puig for an extension. It is tough. Disco came out firing 95 the other day. Everything was just right down the middle? Personally I hope he goes on a little run and they can deal him to someone like the Twins. Romano is definitely a bullpen guy and Stephenson might be too? I’m big on Mahle! He’s worked hard on his offspeed stuff and he has a little crossfire action in his delivery which is hard on righties. I think he’ll be what they hoped Disco could be a few years ago. I always liked Wood w/LA, but his velocity was down last year. I wouldn’t try to keep Roark or Wood. I’m with you on Puig. Reds are 2-8 with a +1 w/run differential. DeGrom, Sale, Greinke, and Nola all fail to record a quality start on the same day. Baseball is a funny game! Peralta, who shut the Reds down on 2 hits with 11 Ks in his last start, just gave up 6 runs in the first inning against the Angels. Baseball’s weird. Castillo reminds me of Soto with that filthy change. Radio guys, including Danny Graves, mentioned that the Marlins were swinging early in the count so they wouldn’t have to see it later. His composure seems much improved over last year, but why wouldn’t it when you’re getting everyone out. That was fun. Can’t wait for tomorrow night’s game. That is all. Chad got some Cavaliers mojo going for the Redlegs. More please. 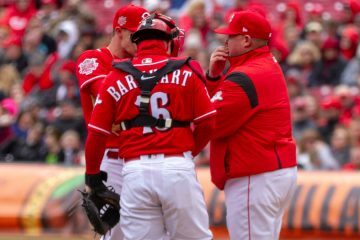 One positive is that the Reds aren’t paying Cozart and Matt Harvey. Castillo is developing as we hoped. An extension might be worth of consideration and build a rotation around him. Just plain fun to watch, even if it was just on Gameday. Keep the pressure on and send the Fish back to Miami with 3 losses. I know there are other more meaningful stats available, but I’d say our young Luis is looking the part of staff ace so far! Any HR is a good HR, but seeing 3 out of the 5 go to opposite field is even better. Until the Reds lose again, Mary Beth is in charge of the game thread. A contract extension with Luis Castillo is imminent. You would think that Luis Severino’s 4 year / $40MM extension and Aaron Nola’s 4 year / $45MM extension signed this off-season would be the comparables. But it is going to be bigger. Six or seven years, and $80MM to $100MM. I don’t think Castillo will have enough service time to be a super-2 after this season and arbitration eligible. It will be close, but Castillo had 1.101 years of service time before this season started. So, an extension will take up 1 pre-arbitration year, 3 arbitration years, and 2 to 3 free agent years. That could add up to $80MM to $100MM very quickly. That would be pretty equitable for both sides. I would wager that the Reds have Castillo signed to an extension by the end of April, mid-May at the latest. We all know what happens when the Reds sign players to extensions. They turn out to play like Joey Votto? Or they turn into Eugenio Suarez? Yeah, but what about the Johnny Cueto extension with the club option? That didn’t turn out so well…oh wait. I’d be surprised… seems like the cold start of the team might dampen Bob’s willingness to commit even more money at the moment. Now, that doesn’t mean I don’t think it’d be a good idea and that it would be shortsighted not to try. I like Castillo a lot, I think he’s worth it. But also, it’s 3 starts. So many people were sad and worried he “couldn’t handle being the Opening Day starter” less than a month ago. Maybe they’ll let this season play out a bit more with him. Was at the game and it was a blast. Added bonuses: Free Chick-fil-a sandwiches for scoring 10 or more runs; free LaRosa’s pizza for pitching 11 or more strikeouts. Also got Club Seats for 35 bucks on Stubhub. There’s something to be said for being one of only 10,000 fans in the park against the lowly Marlins. That’s good eating! Now next time, please let the “wooing” idiots in the late innings know they are ruining the radio call for everyone! I’m sure at that level of attendance you can pick them out.